2 – Like the mythical god Apollo whose arrows killed from a distance, American violence is not an intimate affair. Whether it comes from the barrel of a gun, the rockets of a fighter jet, airborne tankers dropping defoliants on peasants, a B-52 carpet-bombing entire regions from five miles off the ground or the joystick of a computer that directs drone-fired missiles flying over another continent, it is perpetrated from a distance. 3 – The denial of death. This characteristic distance is one of the factors that allow Americans to de-sensitize themselves to the reality of death. In addition, a constant diet of TV crime shows and superhero movies allows us to believe that violence isn’t real, or that, despite our fears, it only happens elsewhere. Hence our disillusionment and punctured innocence when the Sandy Hooks of the world happen to us. 4 – A perpetual war economy, at least since the end of World War Two. Why does America go to war so often? Do Imperial politics fully explain the fact that the U.S. has attacked over forty countries since 1945? Ultimately, our American stories convey an even deeper level of mythic reality. At the core of all western culture – yet expressed in its purest form in America – is the myth of the Killing of the Children. Our greatest secret – the most sacred knowledge, so sacred that it is taboo to ever discuss it – is that the American Empire must periodically sacrifice large numbers of its own children in foreign wars in order to shear up the cracks that appear in our national sense of innocence and white privilege. They die, we are told, to protect freedom. In fact, they die because we want them to die. 5 – Unprovoked attack. Since by definition American violence must stem from the noblest of motivations, our actions are always re-actions to nefarious attacks from the Other, who hates us out of purely evil intent. Hence, no movie cowboy ever strikes the first blow. Similarly, no American President ever strikes at the enemy without first having been attacked. In these narratives, the Other always strikes first, with a “sneak” attack. At the very least, he is preparing to attack, or merely capable of doing so. That, in our myth, is justification for American “pre-emptive” violence. 6 – With four hundred years of these stories deeply woven into the American psyche, we are well-primed to ingest each new one. Among the countless examples, think of “Remember the Maine,” the Lusitania, Pearl Harbor, 9-11, “weapons of mass destruction”, Iranian nukes, Syrian barrel bombs. But think also of the thousands of movie, TV and comic book villains who without exception strike the first blow, often from behind. They don’t play fair. They use “chemical weapons,” which – despite our own use of them – we deem as so terrible that they must be punished. Indeed, every action of the American empire requires such provocations, because otherwise, cracks would quickly appear in the myth and Americans would begin to question the essence of our identity. This essay is about one of those stories. 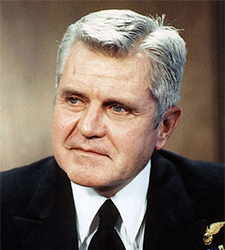 In 2005, Admiral James Stockdale died, almost universally revered as a genuine American hero. Most Americans knew him as Ross Perot’s 1992 vice-presidential running mate. An older generation remembered him as America’s highest-ranking prisoner-of-war in the Viet Nam war, a man who suffered extreme beatings and torture for seven years but never revealed classified information or spoke ill of his country. After his release, he received the Congressional Medal of Honor. So Stockdale knew very well that the President was lying when, the next day, Johnson announced that the U.S. was responding in force to this unprovoked North Vietnamese “aggression.” Either Stockdale said nothing to his superiors or he was commanded not to speak about the event. No, there’ll be no action out there against us today except the flack…I could have said, Hell, no. This is Pearl Harbor; we’re going to attack a country that’s not waiting for it… I didn’t say any of that and it’s just as well. The Gulf of Tonkin Resolution? They had already signed it and Johnson had withheld it. Now I don’t know what happened to it… I laughed to myself. I didn’t put it on the air but I said, Here we go. I’m starting a war under false pretenses… August 5th, 1964, and I was the guy that did it. I wouldn’t have missed it but – so anyway I don’t argue about the Vietnam War legitimacy or anything like that. Here is a most remarkable admission. Of course the war would have started anyway, even if Stockdale had spoken up or refused to go on the mission. Months later, Johnson proclaimed, “We must love each other or die” as he secretly prepared to escalate the conflict into a major war. 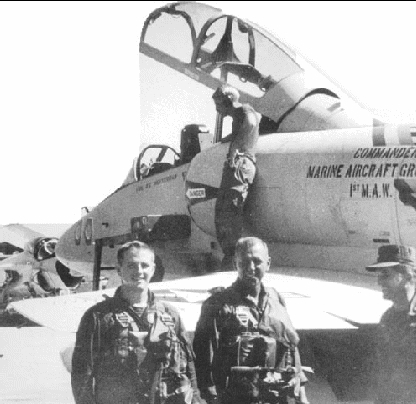 A year later Stockdale was shot down over North Viet Nam and his prisoner-of-war saga began. Several best-selling books, the Medal of Honor and millions of votes came his way. His behavior in the prison was exemplary; he probably saved the lives of many of his co-prisoners. Americans came to see these men, most of whom who had been shot down while bombing North Vietnamese cities, as victims of cruel communists, the “Others” who would later be the stock villains of Sylvester Stallone movies. 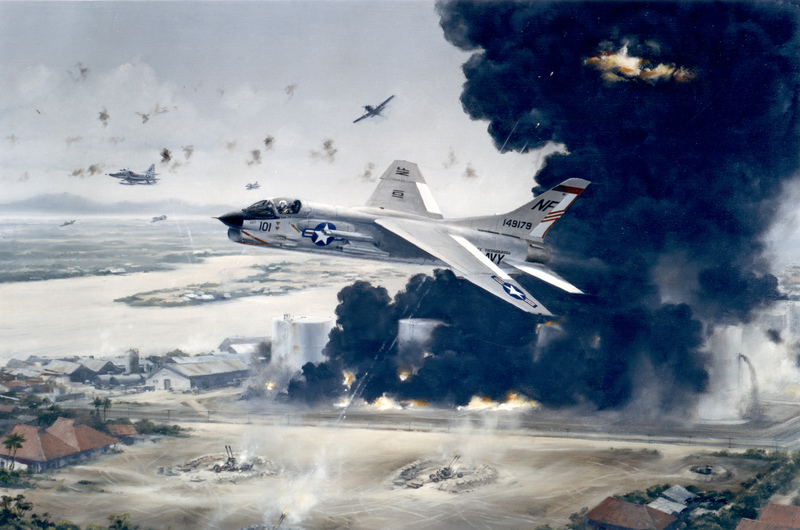 To this day, most Americans think of those pilots as victims, and of the 58,000 American dead as the only casualties of the war. This entry was posted in Uncategorized and tagged Barry's Blog # 47: How -- and Why -- to Start a War. Bookmark the permalink.